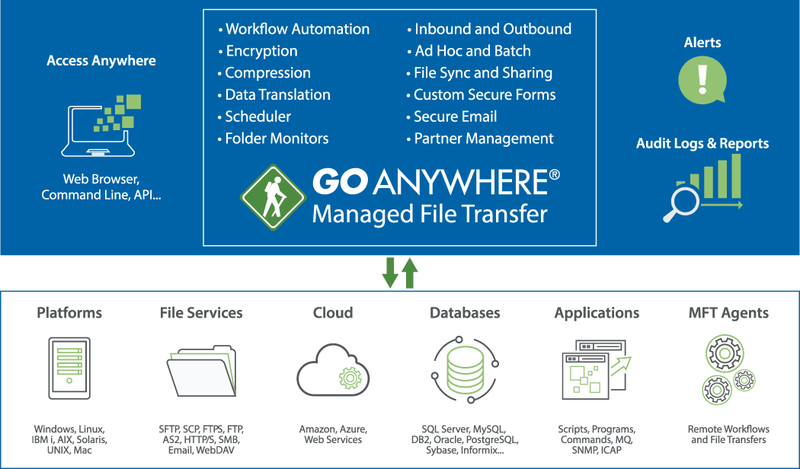 GoAnywhere MFT is a managed file transfer solution that streamlines the exchange of data between systems, employees, customers, and trading partners. It provides centralized control with extensive security settings and detailed audit trails. For ultimate flexibility, GoAnywhere is deployable on-premises, in the cloud on platforms like Microsoft Azure and AWS, or within hybrid environments. Our MFT solution runs easily on platforms like Windows, Linux, AIX, and the IBM i.
GoAnywhere MFT's intuitive interface and comprehensive workflow features will help to eliminate the need for custom programs/scripts, single-function tools and manual processes that were traditionally needed. This innovative solution will reduce costs, improve the quality of your file transfers, and help your organization to comply with data security policies and regulations. With integrated support for clustering, GoAnywhere MFT can process high volumes of file transfers for enterprises by load balancing processes across multiple systems. The clustering technology in GoAnywhere MFT also provides active-active automatic failover for disaster recovery. GoAnywhere's secure collaboration features make connecting with your trading partners, clients, vendors, contractors, employees, and coworkers much easier and faster, especially when you're on the go. Connects to popular database servers including SQL Server, Oracle, MySQL, MariaDB, IBM i, DB2, PostgreSQL, and Informix. Data Acquisition Developer, SPS Commerce, Inc.
Users can add a GoAnywhere connection to HelpSystems Insite, a free web platform that gives admins visibility into their GoAnywhere servers and metrics. Read this article to learn more about GoAnywhere's integration with Insite.